I live in NYC where home prices seemingly always on the rise. When I reach the 250k threshold of tax free capital gains, should I think about selling and re-buying something else and reset my cost basis so future gains are also tax free? Any calculators out there where you can estimate property value increase per year, and how many years you plan to stay to show where the break even point is with tax savings vs cost of selling/re-buying to reset your cost basis? I like these types of questions! The IRS rules on excluding capital gains on the sale of your primary home say if you used a home as your main home for at least two years out of the last five years before the sale, you can exclude up to $250k in capital gains. If you are married filing jointly, the two of you together can exclude up to $500k in capital gains. If your home already appreciated close to $250k or $500k, continue holding it means the future gains above that threshold will be taxable. To be clear, you will still get $250k or $500k tax free. Only the gains above it will be taxable. Say you are single and your $240k in gains now will become $400k when you sell, you will pay capital gains tax on $400k – $250k = $150k. However, if you sell it now and you buy it back or you buy another home of similar value, your cost basis will be reset to the new value. Your capital gains now are covered by the tax free allowance. Your future appreciation will have a new $250k or $500k allowance in another two years. As Mark mentioned, you will incur some costs if you sell and re-buy. You will have real estate agent commission, transfer tax, and moving expenses. If you don’t own the home free-and-clear, you may have to get a new mortgage at a rate higher than your current rate. If you are in California, you will also lose the capped property tax assessment value from Prop 13 and you will see your property tax go up. You can minimize the costs if you find a buyer via FSBO or if you work with a discount real estate agent. The trade-off is between these costs you pay today and the capital gains tax you will save in the future. If you are going to sell in the near future, you are not going to benefit much because you won’t have too much additional capital gains at that time anyway. So ideally you would do this only if you plan to stay in your home long enough for it to appreciate another $250k or $500k and you are not planning to just keep the home until you die and leave it to your heirs. I made a calculator. You can plug in your assumptions and see if it makes sense to do it. As usual, cells in blue are inputs and assumptions. Change them to numbers specific to you. The other cells are calculated. Please don’t change them. it would be worth it to sell and re-buy. By paying $10,000 now, you will save over $50,000 10 years from now. Your one-time $10,000 investment will have a great 18% per year rate of return over 10 years. That’s the positive scenario. However, paying anything close to resembling a full 6% real estate commission to sell and buy something else, say at a total one-time cost of $40k instead of $10k, will lower the return to only 3% per year. If only your ongoing cost increases by $2,000 per year, say from higher property tax, it will again lower your return from selling and re-buying. Staying in the home for only another 5 years instead of 10 or the home appreciating only 2% per year instead of 4% per year will also negatively affect your return from selling and re-buying. Conclusion: In the right situation, selling and re-buying can be a good move to eliminate or reduce future capital gains tax. Use the calculator to find out. My only question – if audited after the second sale, say 5 year later, might the IRS not uncover the first sell/buy was a sham? Why was it a sham when you bought and sold at fair market values? People do it with stocks to harvest tax free gains when they are in the 15% tax bracket. Looks like a sham transaction to me. Please provide the IRS references you based your conclusion that such a transaction is within the code. Some discussion that home prices go up and down might have been appropriate in this article. Where are the references for selling stocks with a gain and buying them back? Publication 523 does not include any exception for buying it back. 2. You have to wait two years to get another exclusion on another home, but nothing keeps you from renting for a year and then buying the home back. 3. You have to live in the home for two of the last 5 years but the years do not need to be continuous. 4. Many variations to the above for special circumstances, such as you used the home for business part of the time, were married, became single, then sold the house. Nothing to really keep you from selling to a family member, as long as the sale is at arms length and no special pricing was arranged — ie as long as it is listed to the public you could easily sell it one year and buy it back the next. If all the gains are excluded, no tax forms need to be filed at all! So, you are relying on not finding something in one publication that says you cannot sell your house and buy it back in one day as the basis that such a transaction is within the code. You also seem to be relying on the analogy you draw on a security sale to the sale of a home. In the case of the sale of the security, you have not maintained ownership of the security. You may have bought back the same number of shares but not the exact same shares. You did not maintain ownership control in the case of the security . The house is different. In your article you suggest – “if you line up a buyer, say a family member.” Once you make such a suggestion you no long have an arm’s length transaction. Basically you have maintained ownership control of the home. I would consider this to be a sham. If you actually sell your house and buy a difference house, then I would believe you would be within the code. I am not seeing your point and whatever it is you have not added any supporting tax law to support it. Just saying something is a sham does not make it so. Let’s just take the simple step one, performed probably hundreds of times each year in this country. A family member sells his house to his relative. An independent appraisal on the home would give both of you an up-to-date valuation and fair-market value that should help stand up to IRS scrutiny. In other words all you have to prove is that the sale price is of fair market value so that the proper long term capital gain is calculated. There is NO tax law that I know of that says you can’t sell your house to a relative and nothing would stop him from selling it back to you later, as long as proper market values for the sale are determined, so the IRS gets any appropriate capital gains above the exclusion, if you meet the exclusion criteria. My initial comment to Harry was for references to support a sale of a house and the repurchase the next day. I think it is on Harry to support his article with appropriate references. If you prearrange to transfer title and then transfer title back without moving out of the house, I question if you have actually had a sale of the house. There was never an intent to give up ownership of the house. That seem to me to be a thing that is not what it is purported to be – a sham. Lining up a buyer just keeps your transaction cost down. It’s not about setting the price artificially low or artificially high. The point of the article is to provide a calculator that Mark was looking for, not that you must sell to a family member and buy it back the next day. If you find a buyer via FSBO that works too. If you want to buy a different unit in the same condo building, that also works. Why would you need a real estate agent for this type of sale? There is absolutely no marketing involved. Just hire a real estate attorney to handle the paperwork instead, like FSBO transactions. If you don’t, all the better. I live in nyc too, and have pushed up the limit before capital gains become taxable somewhat by doing some remodeling. Money spent on remodeling can be added to the capital gains you’re entitled too. For instance, if a single person spends $50,000 on a new kitchen, that adds $50,000 to the $250,000 capital gains allowed and they can exclude $300,000 in capital gains. Not that you’d re-do your kitchen or build an addition or whatever just to exclude more $ in capital gains, but if you’re living in your home long-term, it’s likely you will put some money into it. These are in addition to the “usual and customary fees” such as recording fees, legal fees, realtor fees, title searches, flip taxes, etc. You may also lose a little on property taxes – not like California, but still something. In New York, property tax increases are phased in over five years on some properties (it’s called “transitional assessed value”). So you might not be paying the full tax on the old property, but you might on the replacement property. Not that California is without its quirks. While it is true that _usually_ you lose the benefit of Prop 13 tax limits when you purchase a new home, that’s not always true. There is a one-time exception (Prop 90) that allows you to transfer your tax base to your new home. It applies in only some counties, only to people older than 55, and only if the replacement home costs less than the home being sold. IMHO, the hard part is not the arithmetic calculation, but in knowing the rules, i.e. what the inputs are for the calculation. Research carefully before making a move based on taxes. Absolutely. The hardest part in using the calculator is to come up with a realistic “one-time cost to sell and re-buy”. Sure there are other numbers like the appreciation per year or the number of years you will live there that are some speculation, but in NYC especially, there are lots of numbers to consider in calculating the cost to sell/buy. But still the calculator is very interesting! To be fair, and to offer a pre-emptive strike, when the “Back Door Roth” first was suggested, there was a fear that STD would be cited to disallow. Years have passed and the IRS seems to have ignored the issue. In this case, the first transaction (the ‘sham’ sale) doesn’t appear on one’s return (as Dave noted above) and the second sale, based on the bumped up basis, won’t either. But that doesn’t make it legit. I think the closest analogue is the wash sale rule. It voids (defers) a loss if one purchases “substantially identical” replacement property within a specified time frame (usually plus or minus 30 days). So ISTM that repurchasing the same home within a short enough period of time not to be exposed to market risk would void the gain exclusion. That rationale is somewhat implicit in the STD criteria. If you’re repurchasing the same home, you wouldn’t even need to move a second time to trigger STD. Purchasing a different home, as originally proposed, seems like an easy call. The law generally treats real property as unique. When a sales contract falls through, you can sometimes compel specific performance (get the home). That’s because the property is unique – you can’t just go out on the open market and get the identical property. Since real property is regarded as unique, “replacing” one’s home with a different home is not a replacement at all, but a substantially different investment/home. Thus, while moving every few years may enable you to avoid all taxes on cap gains, it also changes what you own. No sham IMHO. Even if getting the gains excluded was your motivation. Just adding my two cents on the likelihood of this passing muster with the IRS. If you actually sell your house and purchase a different house, I see no issue whatsoever. For the reasons many commenters have already pointed out. I doubt it would even be questioned by the IRS at all. However, if you are selling and repurchasing the exact same home every few years, in particular with a relative, then I think it likely could be scrutinized. The issue is whether on not there were any contingencies or agreements made to repurchase the home when you sold it. If there were, then it likely would be determined to be a sham transaction without economic substance intended solely to gain tax benefits. For a comparable example, you can search the history of SILO (sale in – lease out) and LILO (lease in – lease out) transactions that were heavily used by finance arms of corporations in the last decade to generate paper tax losses while maintaining control of the underlying real property. These were litigated throughout the last decade and all eventually failed, albeit with some failing on the economic substance issue, and others failing of the form over substance issue. Here is an article from Bloomberg that recaps some of the history and a loss suffered by John Hancock Life Ins Co. in the Tax Court in 2013. Obviously, these are not the exact same transactions and you might argue that a home sale is a personal transaction and not a business one. But I think courts would likely find that the same principles would likely apply, and personally, I think it would hard to win a case where you were just buying and selling the same house over and over. We are going off a tangent that’s distracting from the purpose of the article. I edited to put the focus back on the calculator. 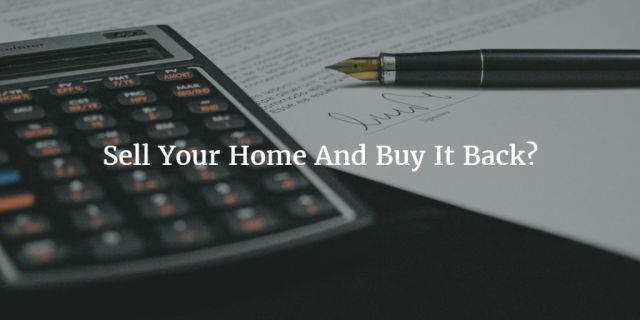 Whether you buy a different home or the same home, whether you buy the next day or the next month, the calculator still works the same. It’s still all about minimizing the transaction costs against future tax savings. If you’re thinking about selling your real estate assets, it might be a good idea to take advantage of Section 1031 before Congress can make any changes (Section 1031. if either party subsequently disposes of the exchanged property within a two-year period, the exchanged property will become subject to tax.). The calculations have synced with my mind. i will take care of that once I buy a new home. Good stuff. Exactly what I was looking for when I asked the question. Thanks! !